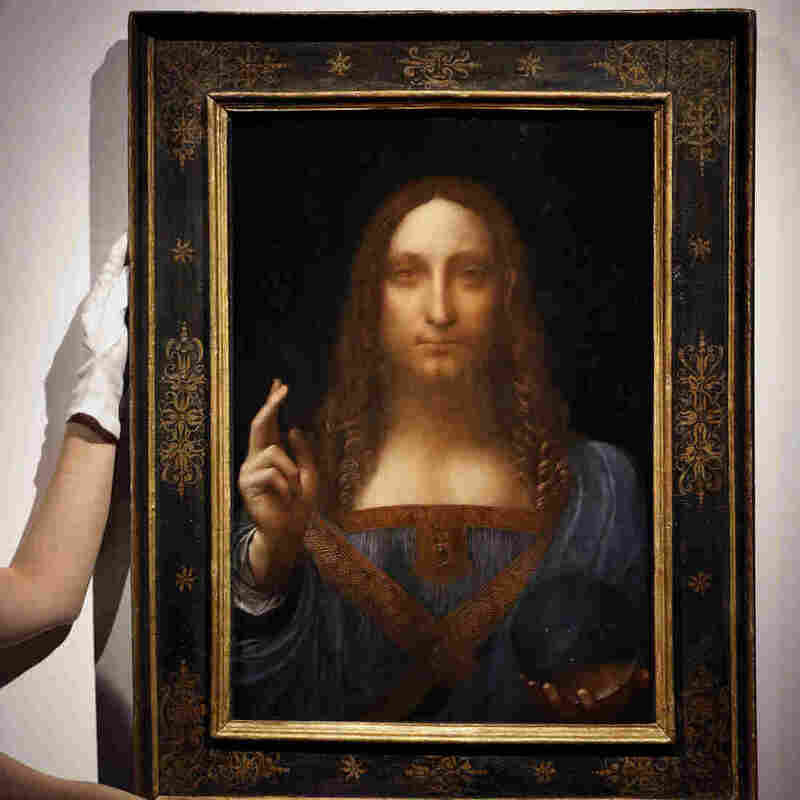 Leonardo Da Vinci Portrait Of Christ Sells For Record-Shattering $450 Million : The Two-Way The sale at Christie's of Salvator Mundi, which dates from around 1500, easily tops previous records set in 2015 for a Picasso sold at auction and a Willem de Kooning sold privately. Salvator Mundi is one of only a score of Leonardo da Vinci's works still in existence and the only one held privately. 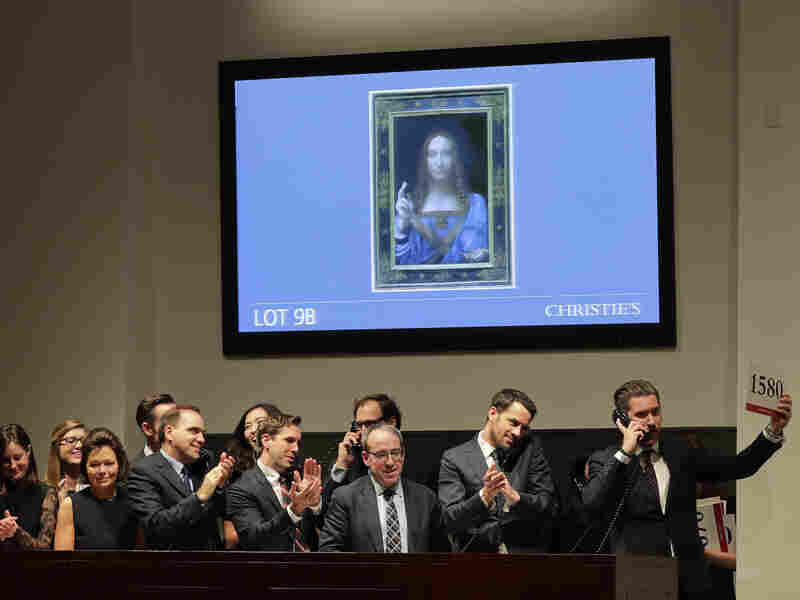 Bidding representatives react after Salvator Mundi sold for $450 million at Christie's on Wednesday. Salvator Mundi (Savior of the World) is one of only a score of Leonardo's works still in existence and the only one held privately. The bidding opened at $75 million and ran for 19 minutes. "Toward the end, Alex Rotter, Christie's co-chairman of postwar and contemporary art, who represented a buyer on the phone, made two big jumps to shake off one last rival bid from Francois de Poortere, Christie's head of old master paintings." The name of the buyer was not immediately released. The final bid was $400 million, but the sale price includes a premium paid to Christie's. "Salvator Mundi is a painting of the most iconic figure in the world by the most important artist of all time," said Loic Gouzer, co-chairman of postwar and contemporary art at Christie's, was quoted by The Associated Press as saying. "The opportunity to bring this masterpiece to the market is an honor that comes around once in a lifetime." The 26-inch-tall painting has an intriguing history. It dates to about 1500 and depicts a figure of Christ dressed in Renaissance-style attire, with the right hand raised in benediction and the left holding a crystal orb. It was recorded in the collection of King Charles I of England in 1649 but was auctioned to the Duke of Buckingham in 1763. It then disappeared until 1900, over which time it was assumed to have been lost or destroyed. When it finally resurfaced, it was damaged from restoration attempts and was purchased by British collector Sir Frederick Cook. At the time, it wasn't seen as an authentic da Vinci but instead attributed to one of his disciples. "Cook's descendants sold it at auction in 1958 for £45 and it was acquired by a US consortium of art dealers in 2005. "After undergoing extensive conservation treatment [completed in 2011], it was determined to be an original Da Vinci work." It was put on the block for Wednesday's auction by Russian billionaire Dmitry Rybolovlev, who had purchased it for $127.5 million in a private sale in 2013. The previous record for a painting sold at auction was set in 2015 when Pablo Picasso's Women of Algiers (Version O) went for $179 million to an anonymous buyer. A private sale of Willem de Kooning's Interchange, also in 2015, fetched $300 million. A previous version of this story misspelled Willem de Kooning's last name as de Koonig.